Immigration reform is now poised to take center stage in American politics. Hastened by the signing of an immigration reform bill, Arizona Governor Jan Brewer, along with seventy percent of Arizona’s residents, have lit the fire under what may well prove a wicked brew of partisan politics, racist rhetoric and violent protest. They made it illegal to be illegal. Actually, the Arizona bill only reinforces, if not just reaffirms, what is already on the books at the Federal level. In the simplest of terms, the very definition of “illegal” is to break a law – ergo, there must be a law that they have already been breaking. So why then would the POTUS shout down the new law as “misguided”? (ABC News has video of Obama’s reaction). At the very least, Obama admits that had there not been a failure to enforce our immigration laws at the Federal level, this would not have been necessary. So we all agree. “Something” must be done about immigration. We’ve been using the word reform so much lately, the word seems to have lost all meaning. Reform, in fact, is not what is needed – we just need to begin enforcing laws already on the books. No one is saying we don’t want people to emigrate to this great nation, we just want it to be done legally. Get in line. Fill out your paperwork. Take your turn. 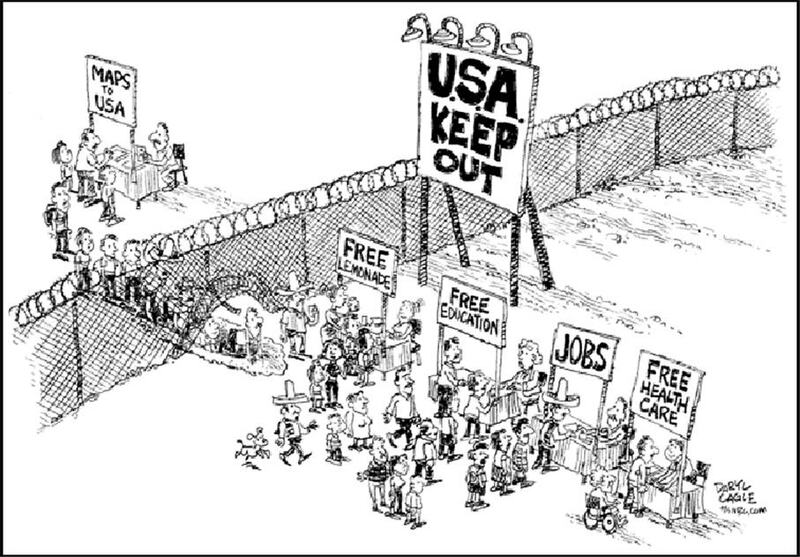 Security – we need a border fence, what’s to stop someone from just carrying over drugs and weapons now? Ask the ranchers in Arizona how they feel about their land and security without it. Jobs – we don’t have enough jobs for the citizens we have now. With amnesty, by some estimates as many as 47 million more people would need work. We’re broke – with only 47% of the population paying taxes, how many more will that 47% be paying for? How many of the newly naturalized would find jobs paying enough? How many would add to our unemployment and welfare burdens? Amnesty is not fair to immigrants – what message is this sending to those who took their turns, paid thousands in legal fees and sometimes years in their foreign nation to gain lawful entry? All of these are extremely important truths to consider when it comes to any amnesty bill. Once legalized, up to an estimated 47 million people now qualify for welfare, unemployment, healthcare and social security (which they never put into). Even if your heart bleeds for people in search of a better way of life, common sense should warn that adding what’s tantamount to an entire nation of people suddenly isn’t sustainable in our economy, our healthcare or our natural resources. What effect will it have on your taxes? Your retirement? Your social security? Your job? Do you remember when Obama promised us that the healthcare bill wouldn’t cover illegal aliens? We all knew that we simply couldn’t afford to offer preventative medical coverage for up to 47 million illegals. The republicans knew it… remember Joe Wilson? (here is the video). Yet if we were to naturalize these illegal immigrants, that’s exactly what will come to pass – and we simply cannot afford it. Governor Brewer and the People of Arizona’s passage of the alien bill spawned protests against such law enforcement. It is already clear that the MSM (main stream media) have taken a side – even taking extra time to further demonize the Tea Party. Some protestors have actually smeared swastikas into buildings using re-fried beans. So, it’s clear – the line is in the sand – people are taking sides. This is a unique opportunity for the Obama administration and democrats embattled in re-election woes. If the democrats are the party for Amnesty, it may follow in large majority that these 47 million freshly minted citizens would likely throw their votes to those that gave them their new freebies, and will continue to give them their freebies ala Joe and Jane taxpayer.